A little over a year ago, local artists John G and Jake Kelly collaborated on an art show called TEN IMAGINARY MOVIES. For the show Jake created ten full size posters for made up films: z-grade horror flicks, 70’s sci-fi trash and giant monster movies. John was responsible for creating the phony ephemera that heightened the illusion of reality: movie stills, VHS boxes, action figures and comic book adaptations. The fake comic book adaptations were for the Cleveland-set THE LAKE ERIE MONSTER, and once the show was over the pair decided to continue their collaboration and turn this imaginary comic book adaptation, of an imaginary film, into a reality. Jake scripted a toxic waste monster story set in 1970’s era Cleveland and John created appropriately dark and compelling artwork. They are serializing the epic tale over the fist five issues of the ongoing series, each also containing brand new supplemental horror stories by the artists. 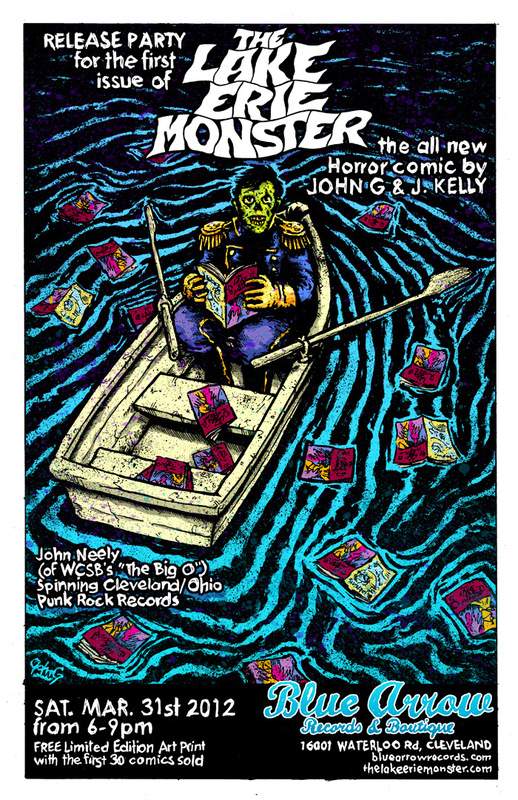 The result is a Rust-Belt horror anthology, complete with a cackling host (a zombified Commodore Perry) and presented in full, eye-gouging color. To celebrate the release of the first issue, the duo are having a party at BLUE ARROW RECORDS (16001 Waterloo Rd.) on Saturday, March 31st from 6-9pm. There will be a limited edition art print for the first 30 who buy the book. John Neely (of “the BIG O” radio show, as heard on 89.3 WCSB) will be spinning Cleveland and greater Ohio punk rock records. The Lake Erie Monster #1 will be available in area stores and for mail order online at the Shiner Comics Store in April. « Lake Erie Monster, Alive!